Deerskin offers an ultra soft, buttery feel that molds to your feet. A double layer of deerskin inside and out gives an added layer of both durability and comfort that you may never want to take off. Size 10 is usually a snug fit for me, which is how I like it. Size 10 in these shoes is falling-off. Going to exchange for a size 9. 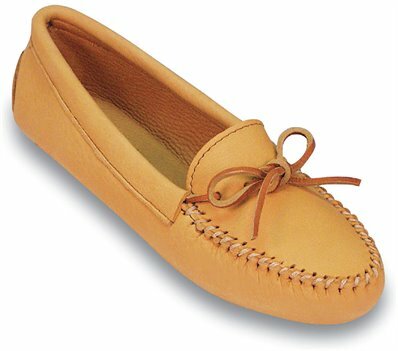 Otherwise, purchasing and from shoeline.com was inexpensive and easy and the Moccasins are high quality.